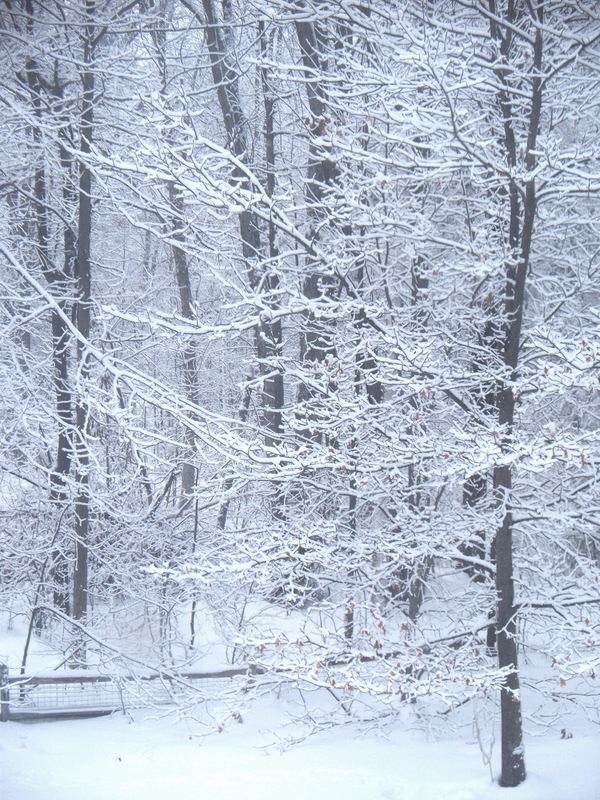 Yesterday morning was thick, silent, as I lifted the blankets from my body and sat up to take in the density of white that had settled upon our woods through the night. The sun made a brief appearance, and then rain, sleet, and a wintery mix as they like to call it up here. Then all was gray and placid for a while. Several hours later, just before evening, I heard the wind shout; gusting with furious energy. It demanded I stop what I was doing and turn to look over my shoulder out the window. Flurries like feathers from a pillow slashed then released were dancing wildly in every direction; until for several moments all was white motion. I think about what it means to be “in the thick of it.” It could mean the fury or it could mean the silence or perhaps the spaces in between. Very descriptive... you made me see what you were seeing. Beautiful picture and beautiful reflections, Laura. Thank you so much. I said this before but I start my West Coast day with your posts and they always lift my mood and spirit. Sometimes it feels like we are the eye of the storm and life whirls around us and sometimes we are right in there, being tossed about. I like the things you think about. beautiful image too. stay warm. We had similar wetaher onMonday night, then some snow yesterday before the wind picked up and it's still blowing quite a bit today! 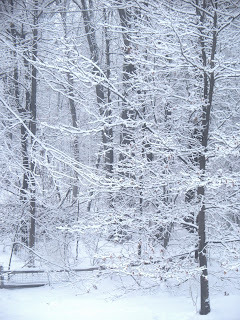 I love your photo of the trees, they're always so lovely with fresh snow on them, aren't they? That is so my mantra today! Thanks for being a mirror! Still is a beautiful photo, Laura if we could just sit inside the house and look out! I can imagine it .... And snow like that is really very thick. "in the thick of it" has more depth of meaning, I think, than "in the thin of it" would. Today was the 5th snow/ice/no school day in Dallas, TX in a week - a very big deal and unlikely happening here in Dallas. I relished perhaps the last day like this of 2011 by mediating and writing in my journal while looking out my bedrooms window over the snow and ice this morning. I like being in the spaces in between - meditative silence where Divinity resides. Lovely writing Laura. I have been busy over here as you know, but I want to thank you for keeping tabs and all your sweet comments. Dear Laura, you said so beautifully what I feel at all times. this is beautiful !! !...reallly really fantastic. Love the sentence that starts with "Flurries like feathers..."